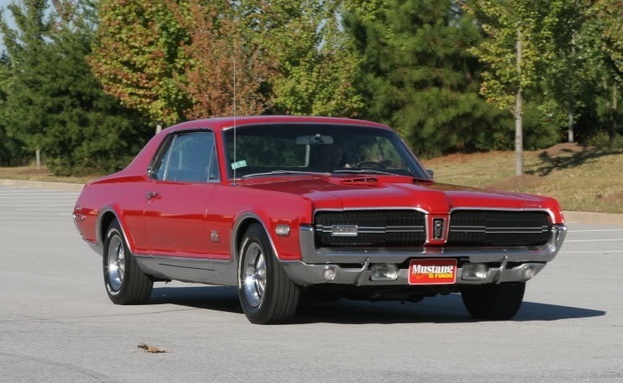 This Cardinal red 1968 Cougar GT-E is one of the rarest Muscle cars you will ever find. An extremely rare cougar with the W code legendary 427-4V engine and C-6 Cruise-O-Matic Transmission. This is the same engine that Ford once used in its NASCAR racing program. This 1968 GT-E is 1 of 1 that was equipped with an AM/FM Stereo Radio. In 1967 the cougar won Motor Trend's Car of the year award. This car is also featured on the cover of Mustangs Unlimited 67-73 Cougar performance, restoration and accessory parts catalog in 2009. The mileage on the dash only reads 69,079 miles. Most of the interior has been upgraded to XR7. Some of the pictures show the old XR7 hood scoop. The hood scoop has been updated to the correct closed hood scoop. The upgrades that have been done to this car make it very unique and rare. The Manufacturer's Suggested Retail Price for the GT-E option package was $1,311.00. Cougar 427E V-8 (4V) engine rated at 390 horsepower @ 5600 RPM and 460 ft.lb of torque @ 3200 RPM. Super Competition Handling Package (heavier duty springs, larger diameter stabilizer (sway bar) and Heavy duty shock absorbers with stiffer front and rear spring rates. Power-dome hood with simulated air intakes. Unique body side moldings with silver gray argent below the molding. Bright engine dress-up kit, including chrome rocker covers, oil filler cap, dip stick, radiator cap, and air cleaner housing. THIS CAR WAS PURCHASED NEW FROM A LINCOLN MERCURY STORE IN MT.VERNON WASHINGTON. THE POWER-TRAIN IS A 351-W ,VERY FEW MILES , EDELBROCK INTAKE ,EDELBROCK CARB. ,DUAL EXHAUST ,ALUMINUM VALVE COVERS ,POWER STEERING ,POWER BRAKES ,AND POWER TOP !! AUTO-MATIC TRANS. ,FACTORY REAR DIFF. ,AND STILL HAS THE FACTORY HUB-CAPS !! THE PAINT COLOR IS A DARK BURGANDY COLOR ,BASE/CLEAR AND POLISHED TO A BEAUTIFUL SHINE ! INTERIOR IS BEAUTIFUL THROUGH-OUT , LEATHER ON THE SEAT COVERS IS SOFT , DOOR-PANELS ARE NICE ,CARPET IS CLEAN , AND DASH IS VERY NICE !!! FACTORY TACH. ,SWING-A-WAY STEERING WHEEL ,AND GLASS BACK WINDOW !! I have recently been traveling in Ottawa Ontario and attended a car show in Aylmer Quebec. I arrived early to the car show and there were many traditional classics as I was ready to leave I decided to take one more look around the grounds. What really caught my eye was a beautiful 1967 Mercury Cougar arriving to display its wares. The car looked familiar but I could not place it. I asked the owner if the car was for sale recently. He mentioned that it was not for sale. Then he put out a magazine in the front windshield of the car and I realized I had the same magazine back in Kelowna, BC featuring the car. Small world!!! This car is owned by Michel Lalonde and he bought the car when he retired in 2005. It is a 1967 289 Standard model in Jamaica Yellow. 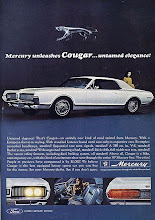 The ULTIMATE Country Club for your Mercury Cougar!!! As we all know, a cougar (Puma concolor couguar) is a carnivorous four-legged mammal found throughout the North American continent. 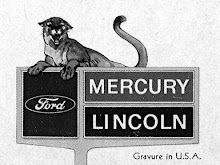 During the late 1960s and early 1970s, however, thanks to the Lincoln-Mercury Division of the Ford Motor Company, the Cougar personal luxury car became synonymous with a very different kind of creature: A middle-aged American male on the prowl to find nubile young females for sexual conquest. Cougars on the PROWL !!!! Two Cougars are better than one!! !